We are proud to announce that Della Buzzard from our Christchurch office has won $2,000.00 for Deaf Aotearoa in The Billies Awards for her work in community development in the Canterbury area! The Billies is an award to recognise a Tangata Whenua, community or voluntary organisation doing its own great community-based learning or research. The award is named in honour of community hero Billie Foreman (1921-2012). To enter The Billies, we had to present a short video about some learning, improvement or a research project Deaf Aotearoa did in the last three years. They wanted to hear how Deaf Aotearoa had taken a ‘strengths-based’ approach. The prize money will be spent on community development projects around the country. The Deaf Short Film Festival organising committee is pleased to announce that the 7th Deaf Short Film Festival is being held in Wellington on Friday 4th and Saturday 5th September 2015. Film Screenings will be shown at Nga Taonga (the Film Archives) with the Awards Function Dinner (with a very exciting theme) in the Te Aro and Waterfront rooms at Mac’s Function Centre. Information regarding the festival is up on their brand new website: www.nzdsff.co.nz. Check out the sign of the week which will be updated weekly. Join their Facebook page, to be kept up to date. Some information about the competition is up on the website. There is no theme for the 2015 competition. People are encouraged to put together a team to enter the short film competition. Additional information in regards to the festival will be released early 2015. For any enquiries, the festival team can be emailed on enquiry@nzdsff.co.nz. New Zealand's only professional inclusive dance company, Touch Compass is auditioning for 2015. They're seeking disabled and non-disabled dancers to join our professional company to perform repertoire, new works and tour. All dancers are contracted and paid on a per project basis. Established 17 years ago, Touch Compass is an Auckland-based inclusive dance company known for challenging what dance is and who can do it. You will have a natural physicality, a passion for high quality performance and a commitment to fully participate in the company. We draw our company of dancers from all walks of life with or without dance/performance experience and we celebrate individual difference. The company has a focus on contact improvisation, a dance technique in which points of physical contact provide the starting point for exploration, along with contemporary dance and aerial work. As well as learning works in the repertoire, you will be involved in the creative process of developing new works. Touch Compass also provides mentoring and training for its performers. Tiaho Trust have organised to be interpreters available all day so please support this event. Come and be proud of NZSL and Deaf culture! Bring a Secret Santa gift (up to $5.00). We will play a game at 5.30pm and open all the presents. PEG game is back!!! No buffet, no plates. You buy your own dinner and drinks. Text Vicki on 021 0244 1602. Have you registered for text 111? Has your address or phone number changed since you registered? Visit their website http://www.police.govt.nz/111-txt to view information in NZSL. Remember it’s better to be ready for an emergency before it happens. Do you want to help to improve the lives of disabled New Zealanders? Do you have a lived experience of disability? The United Nations Convention on the Rights of Persons with Disabilities (the Convention) was adopted by New Zealand on 26 September 2008. A big part of the Convention is the monitoring of its implementation, that is, how well does New Zealand society make rights real for disabled people. The New Zealand Government is funding the New Zealand Convention Coalition Monitoring Group (the Convention Coalition) to interview disabled people about their daily lives and report their experiences back to Government. By June 2016 they need to interview 300 disabled people. They are currently looking for monitors to deliver our next phase of interviews so monitoring can continue across New Zealand. Their next interview sites are Nelson-Marlborough and Northland. Overseas research has found that Deaf women experience information and communication problems when they go to cervical and breast screening. But in New Zealand, we have no idea if Deaf women have these same problems. We would like to ask you if you are able to help us please, to find out if Deaf women do face these issues. It does not matter if you have had screening or not, we would like to hear your views. We are looking for Deaf women aged between 20 – 69 years to take part in one of two focus groups to talk about cervical and/or breast screening in New Zealand. For further information, please contact Deborah Payne at dpayne@aut.ac.nz. One of the biggest, happiest, most magical, musical extravaganzas on the kiwi Christmas calendar! One of New Zealand’s biggest outdoor Christmas concerts as some of country’s top singers, dancers, musicians, choirs and bands get ready to ignite the big stage to present the 21st annual Coca-Cola Christmas In The Park. Every year we set up a Deaf zone with NZSL interpreters and performers on a platform. Book this event in in your diary or calendar so you don't miss this wonderful event! 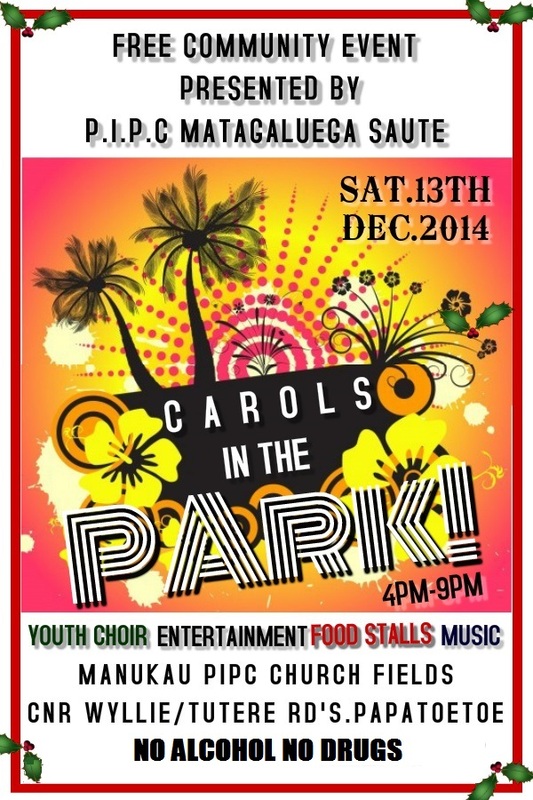 Youth choir, entertainment, food stalls and music. Free community event presented by P.I.P.C Matagaluega Saute. Join the Circability Trust for an explosion of circus, art, film and learning and celebrate Diversity Week at Victoria Park. In the first week of December, pop on down to an inclusive circus workshop, take in a film screening, enjoy some artistic creations by local talent and pick up a paint brush yourself or attend a fun, educational course to learn more about diversity in our patch. The week coincides with the International Day of Persons with Disabilities on Wednesday 3rd December, so they will be showcasing and celebrating the contributions made by people with disabilities as agents of change in their communities. There's plenty more going on, like sausage sizzles, board games and wheelchair races, so click on the flyer or check their website for more information. Spaces are limited and will fill up quick, so please get in touch with us ASAP to book your place. 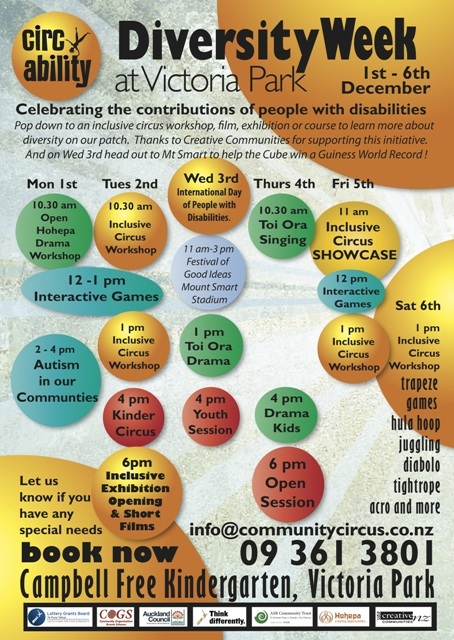 Contact info@communitycircus.co.nz or 09 361 3801. Deaf Aotearoa staff and volunteers attended the Sirens and Sounds Safety Festival held in Avondale. The festival was a free, family fun day that displayed demonstrations of emergency vehicles, music and entertainment, food stalls, games and prizes. 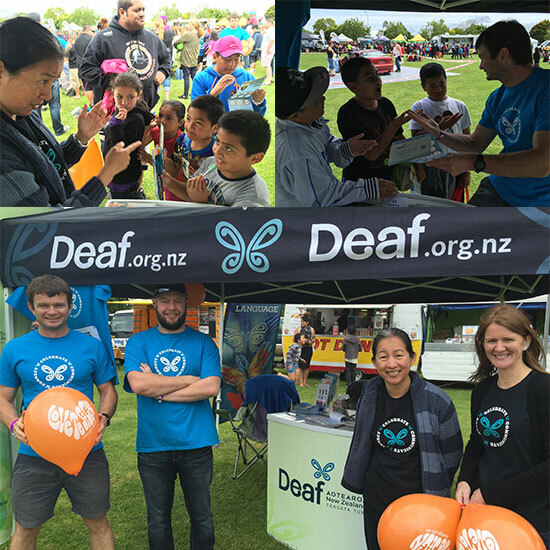 We had a great turnout and many children approached our Deaf Aotearoa stall to learn New Zealand Sign Language and got free balloons! The Sirens and Sounds Festival is a joint venture between the Neighbourhood Safety Panel – a new community volunteer group, and the Neighbourhood Policing Team with the support of the Whau Local Board. James Bichan (iSign manager) will be presenting about interpreter funding at the South Auckland Deaf Club tonight at 8:30pm. Deaf Aotearoa South Auckland have free tickets for World Festival of Magic from Lions. If you, your friends, family or whānau want these free tickets, please come and visit Deaf Aotearoa South Auckland to collect these tickets. Or you can email natasha.cloete@deaf.org.nz or text 021 517 849 to hold tickets for you until you come office to collect them. Please pick which time you prefer. Natasha Cloete will go to South Auckland Deaf Club this Friday 28th November at 8.30pm to give presentation about VRI. Come along this Friday to find out more about VRI. Please see the flyer for more information or watch the video. Please visit your local Deaf Aotearoa office to use computer from community room if you don’t have computer at home. Visit local Deaf Aotearoa if you need more information or email nzsign@deaf.org.nz. This course will help you plan ahead, and arrange payments so that you don’t need to worry about bills through the festive season. The festive season is often a stressful time for individuals and families. Steph will provide handy tips and hints for living on a limited budget and low cost gift ideas for the family. She has lots of brilliant ideas that she will demonstrate how to make and some great ideas for easy entertaining. A light lunch will be provided and NZSL interpreters will be present. 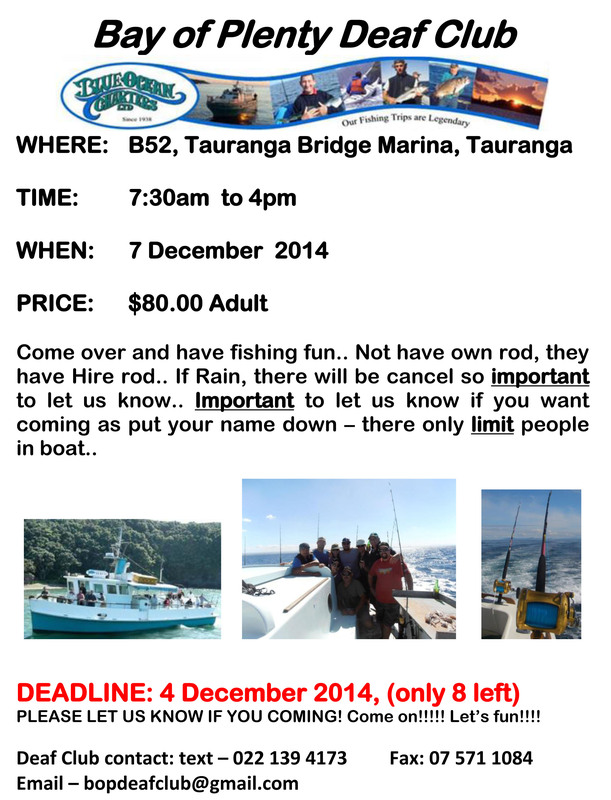 For more information or to book your place please contact Susitina Cook (susitina.cook@deaf.org.nz). Applications to be a NZSL Week tutor will close next Friday 5th December, so please make sure you tell your family, friends, Deaf or hearing, to sign up if they are able to sign confidently. We can help to fill out applications, forward CVs, and record the needed video. It really is a joy to help businesses, health professionals, schools and other interested individuals within our Waikato communities communicate, celebrate and connect which helps to raise the awareness and excitement of NZSL. Design a Christmas tree in the Deaf Aotearoa office! Come into the Hamilton Deaf Aotearoa office and create/decorate/design the best Christmas tree ever! It can be a Deaf themed tree! Materials and art supplies provided. You are also welcome to bring in any old art things to add to it. The tree will go into the Trees at the Meteor competition. All artists and non-artists welcome! Come on! Must be finished by 12th Dec.
Ngaruawahia Playgroup is a wonderful non-profit organization who provides valuable early childhood education, experiences, and fun, to young children and their whanau. So this is an opportunity for local community groups to join together to show what they have available in the community, while fundraising to further support the Playgroup. At this event groups will have fun stalls: face painting, bouncy castle, food stalls, car boot sales, home grown products, arts, crafts, pony rides, fire truck rides, music, talent shows, competitions, interactive entertainment, local artists, loads of fun for the kids, book writers, and many more entertaining events on the day. Baking: No charge. All baked goods will be judged at 10:30am, and then sold as part of the fundraising event. Arts and crafts: $2.00 per entry. Cupcake competition: Come and top a cup cake. Cost $2.00 per entry. Big dig: Bring the kids for a big dig. Find a token and select a prize. Cost $2.00. Talent competition: All entries please contact Flower. Deaf Aotearoa's Community Relations Officer, Sue Lessing, attends the monthly disability advisory group meetings at Tauranga City Council. Discussions are held on how to improve the services for the Deaf and other disabled people to make the community more accessible for all. It could be at movies with having no captions, communication problems, Deaf Awareness, wheelchair access, building access, signs and more. If you have any issues or would like to share your thoughts, contact Sue Lessing on sue.lessing@deaf.org.nz or text 021 920 675 to make an appointment to meet up and discuss. Click on flyer for more information and contact details to put your name down by the 4th December the latest. An exciting outing for the children, families and friends. The parade starts on 2nd Avenue, Devonport Road, end down Devonport Road, link to The Strand and finishes at the bottom of Harrington Street (Lone Star). Parking: Lots of free parking on higher levels or outside car park. 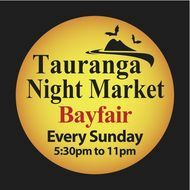 The Tauranga Night Market is Tauranga's first permanent night market! It offers up to 150 stalls with amazing food, fresh produce, art, jewellery, fashion, technology and much more. There will be live entertainment, cultural performances, fortune tellers, foot massages and airbrush tattoos. If you want to hold a stall, call or text 022 588 2282 or email tauranganightmarket@hotmail.com. Have your child photographed with Santa at his Grotto. Santa will be giving all children a free gift with every photo taken. Gifts will be given out while stocks last. Loads of fun for all. Everyone welcome. Let’s celebrate your day. Come along and learn how to download free eBooks from the library collection. They will do their best to solve technological mysteries and answer any questions, no matter what your device. Puke Ariki’s Walking Advent Calendar features 24 Christmas-themed posters, made by members of the community. A new poster is added every day in December until Christmas Eve. Make walking around Puke Ariki a new family Christmas tradition! Join artist Julianne Lafferty to adorn your own heritage cushion cover. Bring family-inspired heirlooms or other items that can be sewn onto a cushion cover, such as fabric, buttons, beads and doilies. Cushion covers supplied. Hui-a-toi will take a break during January and February. It will recommence in March 2015. Onekawa School Deaf Unit finished! The Deaf unit has now moved to a new place at Marewa School. They would like to invite the local Deaf community to visit their new office in Marewa for a look, chat and afternoon tea. Please text 027 303 1860 if you are going. We are looking for tutors to do taster classes during NZSL Week. We may have also classes during the month of May. If this is you then we need you. Email your Curriculum Vitae to nzsign@deaf.org.nz. Email a NZSL video signing why you want to be a tutor to nzsign@deaf.org.nz. Been a NZSL Week tutor in 2014? Applications close Friday 5th December. For more information or any questions contact Lee or email nzsign@deaf.org.nz. Do you find it hard to make phone calls because of a hearing or speech problem? You must register for the 111 TXT service first. Only TXTs from mobile phone numbers registered on the Police website will get through. Remember: sometimes there are delays on the phone network. If you TXT 111 and don’t get a response within two minutes, then contact 111 a different way. Here’s how to register for the 111 TXT service so you can contact Fire, Ambulance or Police in an emergency. Wait for a confirmation TXT from Police. Then you can text 111 in an emergency anywhere in New Zealand where you have access to a mobile network. If you don’t have a computer and want to register please contact Deaf Aotearoa for assistance. Lianna will be on leave from Friday 27th November and returning to the office on Monday 8th December. If you have information information for the CommUNITY Weekly newsletter, please contact James by email at james.pole@deaf.org.nz. If you have any urgent request for support, please contact Ruth Coburn by email at ruth.coburn@deaf.org.nz or phone/text 021 540 195. We will be dining at the Piranis Restaurant this year, let’s get together to celebrate the year 2014 and get ready for the New Year 2015! We will be having a Secret Santa, please bring a wrapped present up to $5.00. If you wish to join us, please let Lianna know by Friday 5th December. Come and join the MASH Trust and the city to raise money for KidsCan while having a great time dressed as Mr or Mrs Clause. 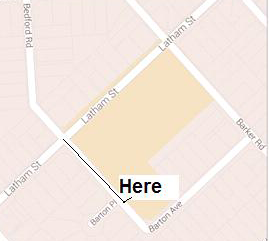 The Santas will meet from the Square at 7:00pm and run or walk 2-3km. All adult registrations receive a Santa Suit with your entry. Kids and families are encouraged to attend as you can run, walk or push children in a pram. After the Santa run stay around for the Palmerston North tree lighting ceremony where we turn the lights on our city's tree and celebrate the start of the festive season. To register for the Santa run, go to http://www.lacticturkey.co.nz/SantaRunEntry.htm. Dinner and BYO drinks on Saturday 17th January from 6:00pm to 12:00pm is now open to everyone. For more information contact Russellstschoolreunion@gmail.com. There will be a lot of activity in the square in the build up to the Christmas Parade. There will be local produce and crafts from 10:00am at the Country Road Christmas or Red Cross Markets, enjoy entertainment on stage from 1.00pm then line up and watch as everyone gets ready for the Christmas Parade at 3.00pm. Parade will start at the Railway land, going up to Church Street and around the square, cutting in at the square carpark and heading down mainstreet south before ending back up at the Railway Land. There will be craft stalls, entertainment, food stalls. Market opens at 10:00am. Parade will start at 1:00pm. At 2:30pm there will be a Childrens Christmas Show with guest Kayne from KidZone. At 3:30pm Carolling in the carpark! Come and join everyone in Feilding for the carnival with stalls and live entertainment from 10:00am. Parade will begin at 2:00pm. Join us to learn more about Māori culture, the meaning of waiatas and other Māori language aspects of pōwhiri and whakatau. This will be a great chance to come together and learn more. This is a free presentation by Wellington Region Emergency Management Office about how to be prepared in an emergency. Bring the family along so everybody can be prepared. Will include how be to be prepared in an earthquake and tsunami and your chance to give feedback on how they can best support your community in an emergency. So, come along and be prepared! The New Year is fast approaching and I would like to give you the opportunity to share your ideas with me about what courses and workshops you would like to see next year. What would you like to learn about, what would benefit you? Please send any ideas and suggestions to me so I can try my best to organise courses and workshops that suit the needs of the community. The Thorndon Fair is Wellington's iconic street fair. Over 20,000 people and 250 stallholders gather on the first Sunday of December every year. The Fair has highlighted the charms of historic Thorndon since 1977. Entry is by gold coin donation. All fundraising is for Thorndon School, which runs the whole fair. Paul would like to invite you all to celebrate his 50th birthday by having lunch at Hangar 58. Please let Rachel know if you are coming by 29th November. Let her know if you require transport to the event. Text on 021 102 4400 or email nelsondeaf@gmail.com. Visit Broadgreen Historic House and find out how a family would celebrate Christmas in 1855. The house will be decorated with trimmings for Christmas, see all the fine things being cooked in the kitchen for festive dinner. What games will they be playing in the parlour? Lots to see for all ages! Only one week left to put your name down! Your local Community Relations Officer, Victoria Walters, is looking for NZSL tutors for NZSL Week 2015. Deaf, hard of hearing, interpreters, families of Deaf children, etc. For more information or any questions, contact your local CRO victoria.walters@deaf.org.nz. VRI is a new service which provides access for Deaf people who are New Zealand Sign Language (NZSL) users, wanting to communicate with government agency staff, health professionals, or schools. Do you have a teacher/parent interviews coming up soon or in 2015? Do you want to use VRI with your children’s teacher at school? Do you want to see a VRI set up at your medical centre or optometrists? We have a VRI request form that you can pick up from our office, or ask victoria.walters@deaf.org.nz to have the form to be send to you. If you want more details about VRI visit www.vri.govt.nz or email info@vri.govt.nz. For more details about the above positions, please see the flyer attached or the job advertisement. The deadline is Monday 8th December 2014. If you need assistance with the application form or other support please contact Victoria Walters. Canterbury’s Deaf Senior Citizens are having their 25th anniversary during the weekend of 24th to 26th April 2015 and their programme will be sent out soon once it is confirmed. If you wish to have more details, please contact your local Community Relations Officer, Victoria Walters, to pass your messages onto the Senior Citizen committee, thank you. Please see the flyer for the cost to join their celebration. In 2015 we will run a course once a month with the first one starting on Tuesday 3rd February. The office will be closed on Monday 1st December because Michelle is away for a training. The office will also be closed on Tuesday 9th December due to a staff Christmas lunch. Tutors wanted for NZSL Week 2015! If you have been a tutor for NZSL Week in the past, fill out the application form and send in. If you are applying for the first time you must fill out the application form, email your Curriculum Vitae (CV) and email a NZSL video signing why you want to be a tutor. Please make an appointment and come see Anna if you need help or have any questions! Applications due before Friday 5th December. Over the Christmas break the office will be closed from Thursday 18th December to Tuesday 20th January 2015. For all emergencies I will be available via text. I recommend getting all your needs sorted before this time. Calling all Southland tutors and anyone else who may be interested in taking part in NZSL Week as a tutor, applications are now open for you to apply. Applications close on Friday 5th December. For more information and applications see our website contact Rebecca at the Invercargill Office. The Great KidsCan Santa Run/Walk is all set to go in 18 cities throughout New Zealand. A major fundraiser for KidsCan, the Santa Run/Walk concept is simple: a 2-3kms fun run or walk in a Santa suit. Each adult receives a free Santa suit as part of their entry fee. Kids under 13 will get a Santa hat instead of a suit. At registration on the day of the race you will collect your race number and Santa suit. The proceeds will go to the charity KidsCan to ensure all Kiwi kids affected by poverty can look forward to a brighter future.